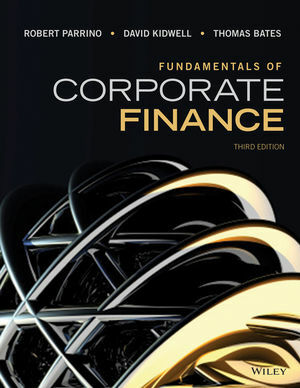 Fundamentals of Corporate Finance, 3rd Edition by Robert Parrino, David Kidwell, and Thomas Bates develops the fundamental concepts underlying corporate finance in an intuitive manner while maintaining a strong emphasis on developing computational skills. The authors believe that students who understand the intuition underlying the basic concepts of finance are better able to develop the critical judgments necessary to apply financial tools in real decision-making situations. The Third Edition offers a level of rigor that is appropriate for both business and finance majors and presents the content in a manner that all students find accessible and engaging. Robert Parrino has a B.S. in chemical engineering from Lehigh University, an MBA degree from The College of William and Mary, and M.S. and Ph.D. degrees in applied economics and finance, respectively, from University of Rochester, as well as the Chartered Financial Analyst (CFA) designation. He is co-founder of the Financial Research Association, and was Founding Director of the Hicks, Muse, Tate and Furst Center for Private Equity Finance. ORION: Based on cognitive science, WileyPLUS with ORION helps students learn by learning about them. An Intuitive Approach: Finance concepts are explained in an intuitive context to help students develop a richer understanding of those concepts and gain better insights into how finance problems can be approached. Analysis and Problem Solving: In addition to the many numerical examples that are solved in the text of each chapter, this book has almost 1,200 end-of-chapter homework and review problems that have been written with Bloom’s Taxonomy in mind. Decision Making: In the end, we want to prepare students to make sound financial decisions. To help students develop these skills, we illustrate throughout the texthow the results from financial analyses are used in decision making. An Intuitive Approach: Explaining finance concepts in an intuitive context helps students develop a richer understanding of those concepts and gain better insights into how finance problems can be approached. Building Intuition boxes provide a statement of an important finance concept along with an intuitive example or explanation to help the student “get” the concept. Learning by Doing applications contain quantitative problems with step-by-step solutions to help students better understand how to apply their intuition and analytical skills to solve problems. Decision-Making Examples emphasize the decision-making process along with computation and provide students at all levels with experience in financial decision-making. Adaptive Learning: WileyPLUS is equipped with an adaptive learning module called ORION. It provides students with a personal, adaptive learning experience so they can build their proficiency on topics and use their study time most effectively. Finance Weekly Updates: www.wileyfinanceupdates.com. Every week brings you the latest news relevant to your Finance course. Password only available to current users.